My schedule is hectic, with no visible prospects of loosening up. I made the dough last night and today between a conference call and a shopping expedition the cookies went into the oven and the house filled up with the sweet smell of Easter. Happy Easter! How to make: Beat the butter (room temperature) with the sugar. Add the three eggs, milk and vanilla. Beat a while longer until they are well combined. Put the flour in a big bowl. Make a hole in the middle and add the butter mix. Use your hands to fold in the flour and knead the dough. It should be firm. Wrap the dough in cling film and put it in the fridge for one hour. When ready to make the cookies, take the dough out of the fridge. Get a handful of dough and using your hands roll it in a cord. Cut it the cord long enough so you can twist or give it any other shape you like. Repeat until you use all the dough. Line a baking sheet with a silicone mat or parchment paper and bake in 370F/190C for about 18 minutes. 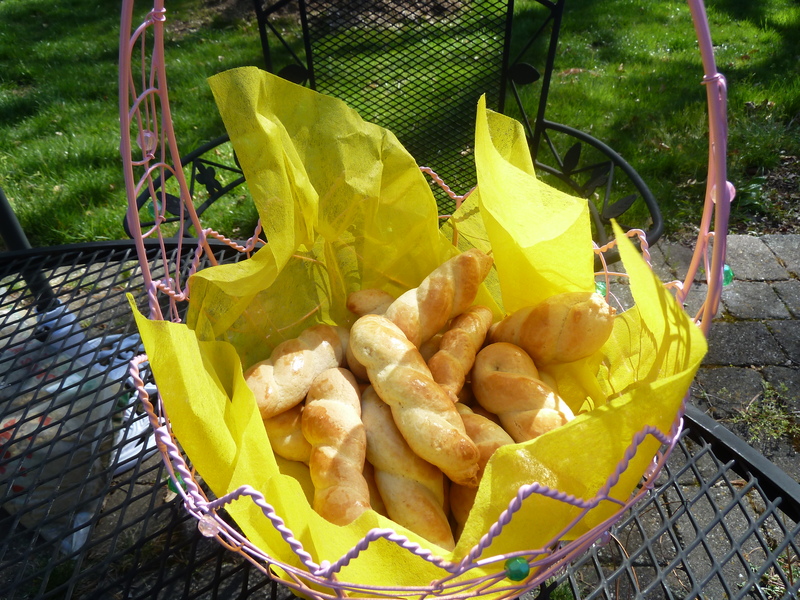 Your easter cookies look very very delicious…..we bake for easter something like this,,,,,in Greece!!! Hi Elena and welcome to mydinnertoday! Yes, it’s a Greek recipe. It’s simple but works well and makes cookies that are quite soft if you don’t overbake. I just visited your blog sweetcookies4you!. Your creations are amazing!!!! I’m honored you visited mydinnertoday. I could never recreate your cakes if I tried! I hope you have found a way to make a living out of your pieces of art. best easter cookies ever! Love u! ur amazing!!!!! Thank you, Melina! It’s a pleasure to see you enjoying them. Love you more!